G113 – Minimize the number of steps it takes to reach a given screen. Minimize the number of steps it takes to reach a given screen. The steps should be simple and number of steps needed to achieve a given screen should be minimized, fostering a good navigation. An useful way of presentation is through of the use of a hierarchy and grouping of information into meaningful categories, focusing only the most relevant items. Procedures inconsistent with established practice. Examples of well-designed hierarchy menus. 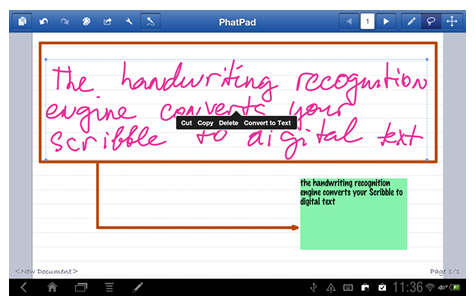 G112 – Avoid note taking or scribble functions. Avoid note taking or scribble functions. The use of note taking or scribble functions should be avoid. This technique reduces the legibility. Example of an application using handwriting. G111 – Avoid some gestures in the multi-touch interaction. The use of some gestures in the multi-touch interaction can be difficult to performing by the older adults, namely the most complex gestures, due to some physical changes associated with the aging. Rotate gesture is an example of a difficult to perform gesture. Elders using rotate gesture during a testing session. G110 – Error messages should be simple and easy to follow. Error messages should be simple and easy to follow. In the presence of an error, the system should describe the occurrence explaining how to recover, without blaming the user by this situation, once older adults are more prone to blame themselves for errors, because they have low experience with technology. Their motor skills also influence the occurrence of errors. The language employed in the error messages should be understandable by older adults. 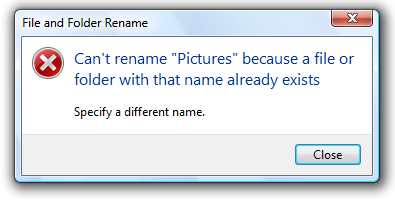 A good example of an error message. G109 – Use medium or bold face type, e.g., Sans Serif type font,i.e., Helvetica, Arial. Avoid other fancy font types. Use medium or bold face type e.g. sans serif type font i.e. Helvetica, Arial. Avoid other fancy font types. Selecting an appropriate font type is crutial in a design of user interface for the older adults. Using sans serif fonts, such as, Arial Helvetica Century Gothic, facilitates the reading of texts on the screen. The size of font type should be large or preferably adjustable. Script Fonts and decorative fonts that are difficult to read. Use of font types with serifs. Text examples using as font size, 12 and 14 points. Design, Elderly, Font Type, Layout, Reading, Text,Vision. G108 – Main body of the text should be in sentence case and not all capital letters. Main body of the text should be in sentence case and not all capital letters. Writing of text should use the sentence case and avoid the use of the uppercase. Meanwhile, the uppercase can be used to draw attention of some text parts, example: UPPERCASE DRAWS ATTENTION. Uppercase should not be used for long text blocks. Example of texts using uppercase and sentence case. Design, Elderly, Layout, Reading, Text, Vision. G107 – The text should be double spacing between the lines. The text should be double spacing between the lines. The ideal text spacing for older adults in body text is double-spaced; this format increases the readability and legibility. 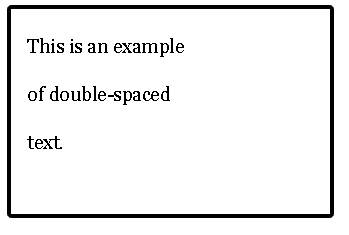 This example shows the use of double-spaced text. Design, Elderly, Layout, Legibility, Reading, Text, Vision.